Home » Your Input Needed: Safe Transportation! Your Input Needed: Safe Transportation! Take Action for Greenways and Trails: Two opportunities for bike and pedestrian improvements. Where do you think walking and biking trails or connections are needed? Where do you experience "problem" areas for speeding, traffic congestion, road damage, or unsafe pedestrian crossing? Help the Pennsylvania State Transportation Commission determine their priorities for funding by taking the short survey, ranking issues, and mapping your concerns. In the Prioritize Section of the survey, please join with us to ask PennDOT to prioritize bicycle and pedestrian safety. In the Add A Comment Section, ask them to consider creating or improving river access when working on local or state bridge projects. Thank you! Our governor will soon be deciding the fate of our state's transportation funding. If you want safer roads and bridges, bike and pedestrian facilities, and road programs that reduce water pollution, join us and contact your representative this week! Our state has 9,000 miles of roads in poor condition and 4,400 deficient bridges. Obviously, the current level of state transportation funding does not adequately meet our needs. Moreover, 59% PA voters have said they are willing to pay $2.50/week to improve safety and relieve congestion. 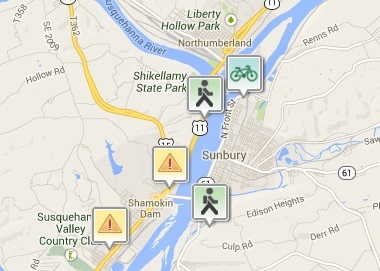 The Susquehanna Greenway Partnership (SGP) recognizes that the passage of a comprehensive PA transportation funding bill will positively impact Susquehanna Greenway communities by increasing state funding for multi-modal transportation programs. Robust multi-modal systems help to promote tourism and use of our region's system of water and land trails, reduce congestion on roads, and promote in-fill development that preserves green space and supports vibrant towns. $10 million for bike and pedestrian safety, streetscape & lighting projects. This is the first time in the history of PA transportation funding legislation that a grant program for bicycle and pedestrian facilities is being proposed! Dirt and Gravel Roads - Increased allocations for this program which reduces road runoff and improves our water quality. Multi-Bridge Program - Will save costs by allowing multiple bridges to be rehabilitated as one project for design and construction purposes. Calling your representative - They appreciate hearing from constituents! Send an email to your representative urging them to support a comprehensive transportation funding solution that invests in biking and walking, and encourages healthy, sustainable, connected communities. Sharing this news with your family, friends, and social networks. 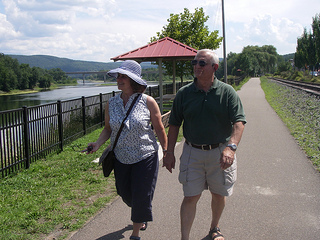 Thank you for supporting bike, pedestrian, and river connections along the Susquehanna Greenway!